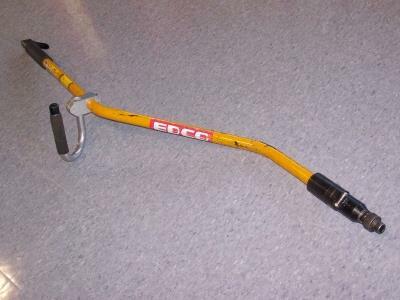 Ergonomically designed hand held air powered floor scraper. Requires a minimum of 8 CFM volume of air regulated between 80-90 PSI. Removes: Vinyl, Quarry or Ceramic Tiles, Carpet, Rubber Ply Roofing, Asphalt, Concrete, Grout, Caulk. 8 CFM Electric Air Compressors available. Handle is 66" long for operator comfort while working. AIR COMPRESSOR, 8 CFM ELECT. * Please call us with any questions about our tile stripper air w/ 1 bit rentals in Oak Grove MO, Blue Springs MO, Independence MO, Lexington MO, Odessa MO, Independence MO and Western Missouri.